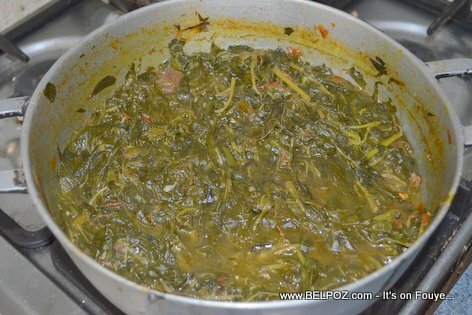 One of the staple foods in Haitian cuisine, especially in the Artibonite region, is 'legim LALO ak vyann.' Haitians simply call it LALO. Legim (Legume) is a Haitian dish that is comprised of a mixture of cooked vegetables mashed up together and cooked with meat. LALO in English is "JUTE Leaves" and 'legim lalo' is just the lalo (no other vegetables), spices, and the meat. When lalo is served with crabs (lalo ak crab) it is so delicious. On your next trip to Haiti, try eating some legim LALO ak vyann. For my Haitian brothers and sisters: Gade photo saa... Yon chodyè legim LALO ak vyann... 20 goud Lalo, 100 goud vyann bèf, total 150 Goud... Oulala!! !